Within each of us lies the heart of an artist waiting for an awakening into a new vision. Marcel Proust once said that 'the real voyage of discovery lies not in seeking new places but in seeing with new eyes.' I want my paintings to help people discover their new eyes. Suzanne DesLauriers was born of Scotch Irish descent in North Carolina, but was raised in a missionary family and spent most of her early years in Brazil. She remembers the bright greens and reds of the lush tropical plants against a lemon yellow sun and a bright, clear cobalt sky. This same color sensibility permeated her soul and has accompanied her through her years as an artist and an educator. She remembers her first trip back up into the Blue Ridge mountains and how the light on that late September day played sideways through the trees over the ridge casting one beautiful shadow after another against yellow green fields and a clear blue sky. Her passion for Winslow Homer and N.C. Wyeth and their clear crisp use of color found a home here in the mountains of North Carolina. Suzanne received a BA in fine arts from Florida Southern College, an MA in art education from the University of South Carolina, and she received her National Board Teacher Certification in 1999. She loves helping her students "unlock the artist within' and because of this passion she received the 1996 Western N.C. Creative Teacher of the Year award, was nominated for the 1999-2000 North Carolina Secondary Art Teacher of the Year, and was listed in Who's Who of American Women and Who's Who in America for 2004-2009. Most recently she has also earned an entry in Who's Who in the World 2009-2010. She has exhibited in galleries in Florida, South Carolina, Georgia, and North Carolina and is a member of the artist group Hands in the Hills. 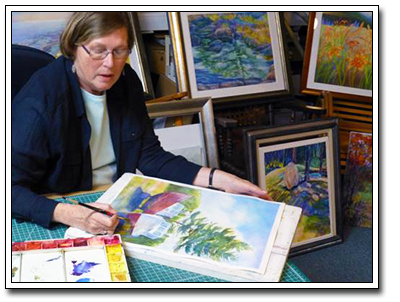 Most recently she was a Humanities teacher at Tri-County Early College in Murphy, N.C. and also teaches painting at the John C. Campbell Folk School in Brasstown N.C. Her greatest love, outside of her beautiful family, is to paint.